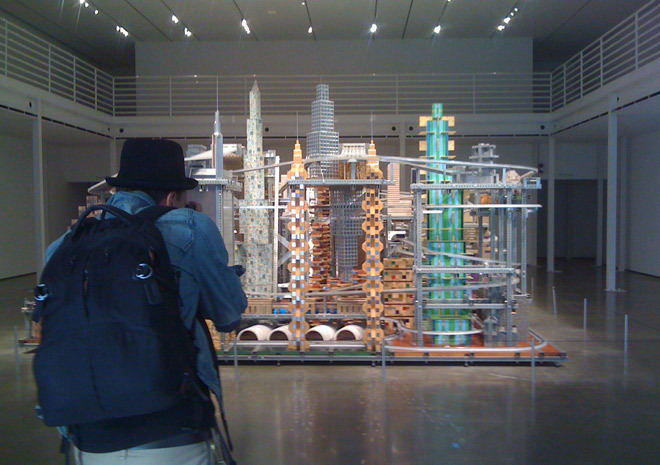 Photographer Spencer Lowell focuses his camera on Metropolis II at LACMA. Urban Light, artist Chris Burden’s collection of 202 cast-iron L.A. street lamps that welcomes visitors to Los Angeles County Museum of art, may be the most photographed work of art in L.A., but Los Angeles magazine has hired a photographer to shoot it only it once, for our November profile of Burden written by R.J. Smith. Photographer Spencer Lowell got to the museum around 4 p.m. on September 24 and headed inside to see Metropolis II, Burden’s futuristic, magnet-powered cityscape sculpture with 1,100 moving cars that takes up a large gallery, first. He snapped each side of the structure, then moved to the balcony and shot it from above.